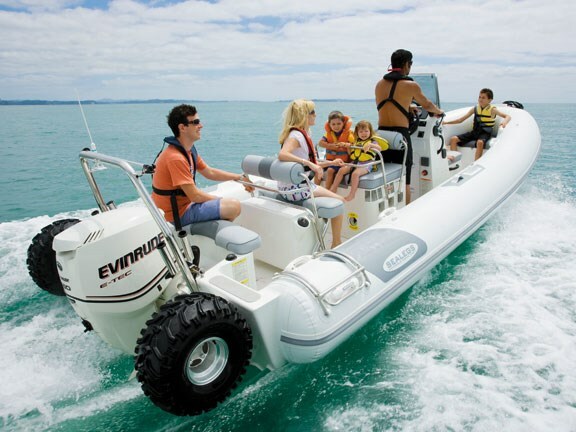 Since inception, some 550 Sealegs RIB have been sold – the vast majority to recreational boaties. But the growing number of end users now includes search and rescue teams, fire departments, police, emergency services, Coast Guard services and special forces. The new features will make the boats even more appealing to these groups. 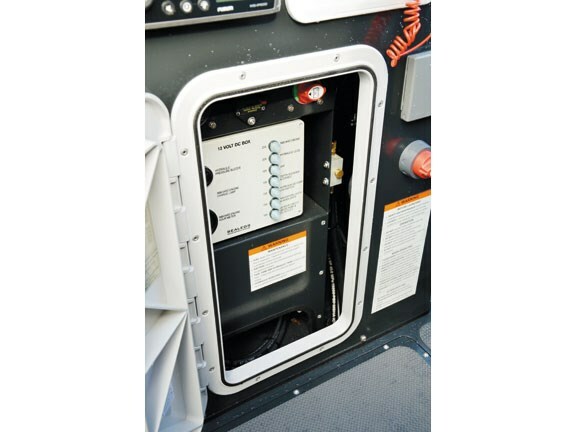 The most significant new developments are a more powerful inboard engine to drive the boat’s hydraulic systems, and the introduction of All Wheel Drive (AWD) and Extended Run Time (XRT). Essentially they’re geared to advancing the RIBs’ abilities to negotiate difficult terrain with increased traction, and offering a longer "operational window". Previous models were equipped only with rear-wheel drive. Sealegs engineers have re-configured and adapted the hydraulic drive system to include the front steering wheel. Additional traction ramps up the vessel’s ability to negotiate rough, slippery or steep terrain. 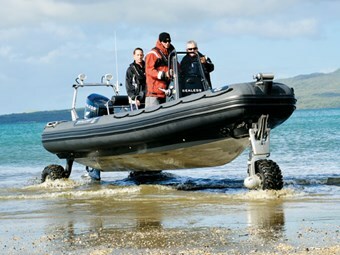 For easier manoeuvring with AWD activated, Sealegs runs in limited slip mode. But if maximum traction is required, depress the button on the hydraulic joystick to engage full diff lock mode. This forces all driving wheels to turn at the same rate for reduced wheelspin – useful for particularly steep or tricky areas. The usefulness of the additional drive wheel and traction is supported by the introduction of the Extended Run Time. 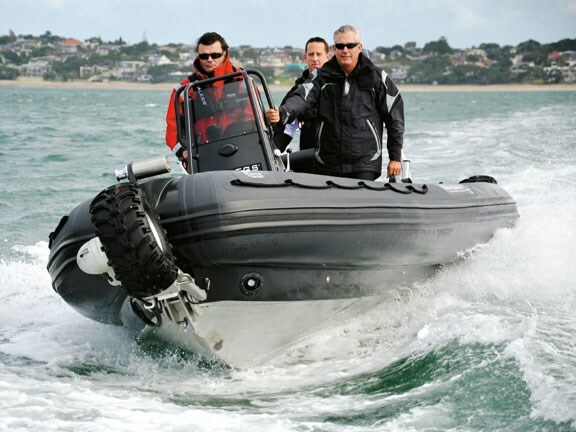 Previous Sealegs RIBs were fitted with a 16hp Honda four-stroke engine for powering the hydraulic system – the pump used for lowering/raising the legs as well as the actual drive system on the wheels. The new models have a 24hp V-twin Honda. It’s an air-cooled engine, light, simple and very, very reliable, says Sealegs founder Maurice Bryham. And it’s been fitted with what is effectively an inter-cooler for the hydraulic oil. Previous models – without the inter-cooler – could only "drive" for 10 minutes (with an hour required for cooling down again). The new system extends that run time to 30 minutes. The conventional launch/retrieval operations on the boat ramp have been transformed, and the job is simplicity itself. 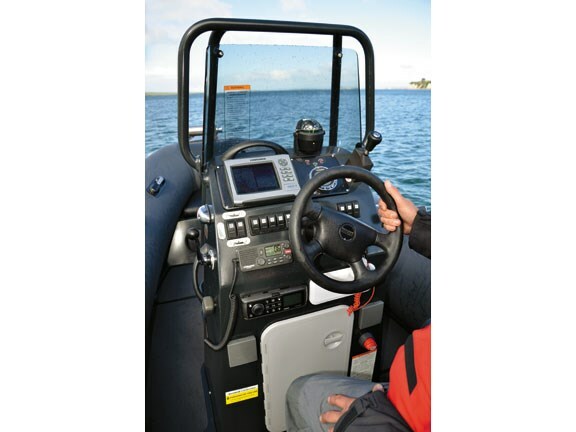 Approaching a beach (or the boat ramp) you throttle the main engine back to idle speed and tilt it up slightly. You start the little Honda (it draws its fuel from the same tank as the main engine) and hit a button on the dash to deploy the legs. They fold out quietly and without fuss (takes about 10 seconds). Easing forward, you engage the Honda’s drive throttle (increasing the hydraulic pressure) as you feel the wheels touch the bottom. And they extend down a considerable distance, so there is little chance of grounding the prop. A little "push" from the main engine may help to get the wheels firmly aground. Kill the main engine, and drive ashore. 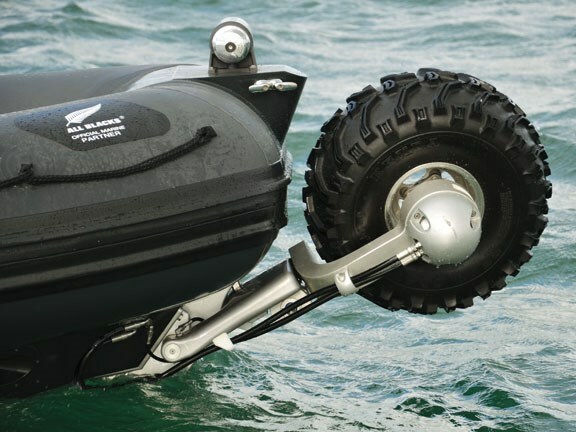 The main engine’s steering system doubles for steering the front jockey wheel – another example of the RIB’s clever hydraulic system. 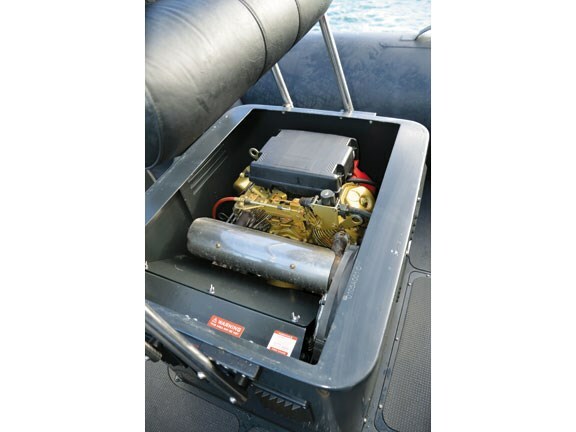 The drive system is designed for torque rather than speed, and the boat trundles along at 10km/h. 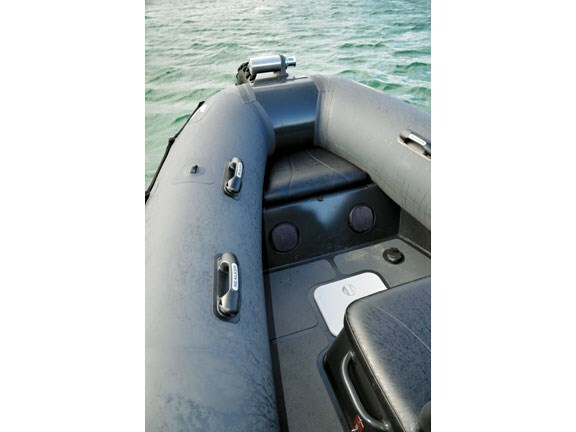 To get out of the boat once you’re ashore, the front leg retracts and lowers the front of the RIB, allowing you to easily clamber over the bow onto the sand. 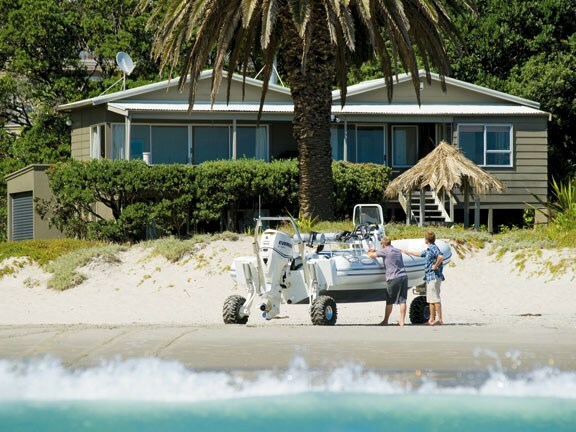 For recreational boaties – and especially those with beach houses – the RIB’s obvious appeal is the ability to drive in and out of the water without the usual tow vehicle/trailer/boat ramp rigmarole. If you have to tow it to and from the water, the launch/retrieval process is simple – you drive it on and off the custom-designed trailer. Once on the trailer, you retract the legs and the hull settles into its cradle. If 10km/h on land sounds like a sedentary pace, the RIB more than makes up for it on the water. 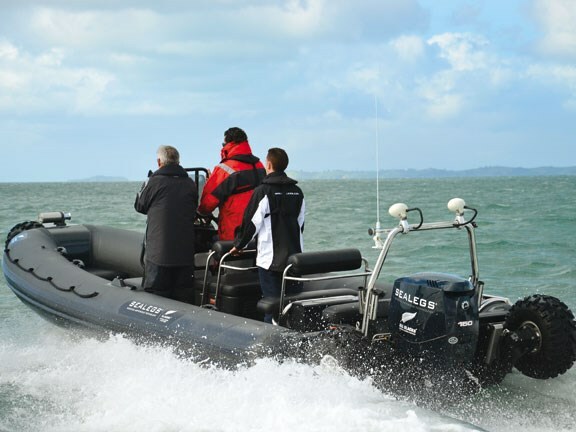 Sealegs is happy to fit any outboard to its vessels, but prefers to equip the 7.1m RIB with a 150hp Evinrude ETEC. "It’s a very quiet, clean-burning engine with an excellent power-to-weight ratio," says Bryham. "We’ve engineered the RIB for low weight and agility, and feel the ETEC complements it perfectly." With the 150hp ETEC and a full tank of fuel, the 7.1m model weighs in at 1220kg – which accounts for its adrenalin-pumping acceleration and pace. At wide open throttle she barrels along at 78km/h. It’s a beautifully responsive hull, carving precisely through the water. Pronounced chines and the Hypalon tubes combine well to deflect spray, and in high-banked turns I was relieved to note that the rear wheels remained drag-free, well clear of water. The 80-litre, built-in under-floor fuel tank may seem a little sparse – particularly since the "in-board" Honda draws from the same supply. 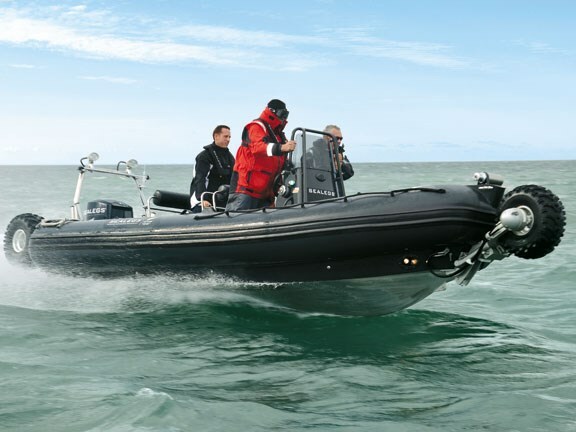 But the RIB is a very light, easily-driven hull – I guess it depends on how heavily you lean on the throttle. 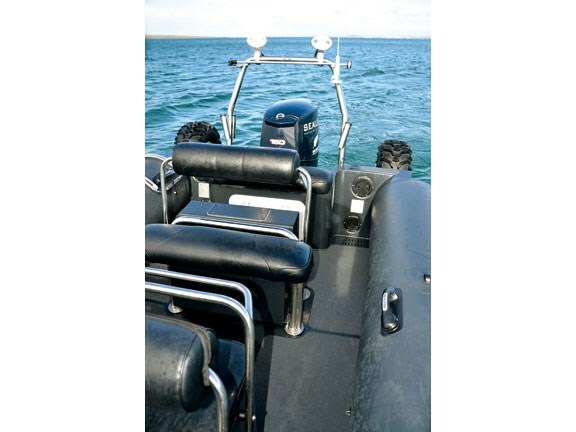 The Sealegs RIB is an interesting proposition for boaties – and I’d suggest it will appeal to a particular kind of person. Throwing a line over the side is certainly within the ambit of the vessel’s versatility, but it’s not the ideal fishing platform, and that probably eliminates a large segment of the recreational market. But it is a wonderful vessel for those more inclined to family fun and off-the-beaten-track adventures. She’s spacious and will accommodate six to eight adults in comfort, with plenty of storage space. With a tow pole, skiing and wakeboarding are obvious activities, and the rear seat has a reversible back rest, perfect for the observer. Divers will relish the easy entry afforded by tubes, and there’s a neat fold-up boarding ladder on the starboard sponson. For me the RIB’s standout advantage is the freedom it offers for exploring beaches and islands off limits to conventional boats. Being able to drive onto a remote beach protected by difficult access is very appealing – no need to anchor offshore, no need to get wet, no need to beach the boat, no need to worry about the tide. At around $129,000 the 7.1m RIB is not the most affordable boat in its class, but it is a unique vessel and will no doubt be tempting to those with the appropriate wallet and an adventurous spirit.